Illegal producers of fake spirits in China have upgraded the quality of their counterfeits and used genuine packaging to make their products taste and look almost as good as the real thing, according to police in the city of Huaihua in south-central China’s Hunan province, who busted a criminal ring which formed a complete fake liquor production chain. 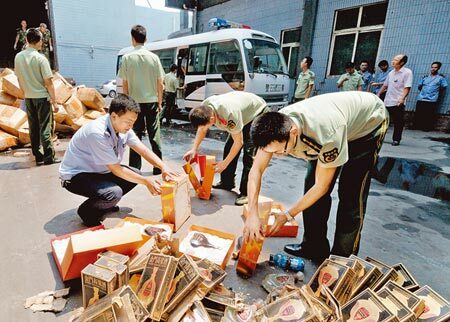 During a joint raid, police found a hideout of the criminal ring that contained fake Guojiao 1573, Moutai and Jiannanchun worth 4.3 million yuan (US$675,000) with packaging, labels and certifications. They also uncovered many liquor jars, a plastic barrel and a machine that seals bottles, according to the Chinese-language 21st Century Business Herald. One of the suspects told police that they bought liquor from a private distillery in Maotai, where the premium Kweichow Moutai is produced, which are run by professional distillers. He boasted that the quality of their fake liquor products were almost as good as the real thing. However, he admitted using the same ingredients to make fake “15-year-old” and “50-year-old” liquor. In order to make their fake products looked more convincing, the gang put in a lot of effort into imitating the lighters, the user manual and the shot glass that come with genuine bottles of Moutai. The suspect told police that he obtained these items from his “sources” that collected used bottles for him and knew exactly how these bottles will be used. Reporters from the newspaper found there are recyclers who specialized in collecting used premium liquor bottles. A used bottle of a 15-year-old spirit can be sold for 300 yuan (US$47) while an empty bottle of a 50-year-old spirit can be sold for as much as 4,500 yuan (US$706), a recycler said. A hotel staff member told the newspapper that an individual person bought empty liquor bottles from them. The person asked the staff specifically not to damage the packaging in any way. The buyer would pay more if the bottle was largely intact. Lawyers have urged the central government to specify regulations and monitor the recycling of premium liquor bottles to stem the operations of such organized gangs.